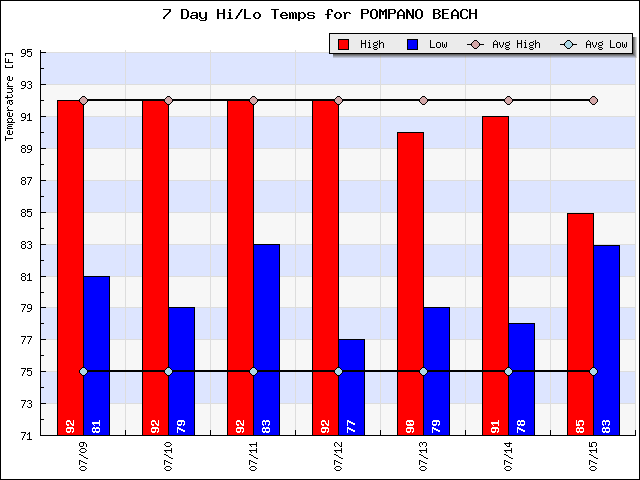 83F is where we are starting the day in Pompano with some clouds. Radar is much less active compared to the last couple days and overall we will see less rain today as we go to a high of 91F. Weather threats today are the chance of a scattered thunderstorm and a moderate risk of rip currents. Looking at the past week we continue our trend of normal to near-normal highs and our lows continue to run above average. So is it warmer than normal? Yes, if you look at our daily average temperature which would be about 86.5F compared to the normal of about 84F. Here is the past week’s data.